One of the disadvantages of never reading any source material is that sometimes anime come along that are harder to follow than others unless the viewer has a good deal of knowledge about the characters and/or plot. Tokyo Ghoul is one of those anime, and I have to admit, there were times in this somewhat breathless episode that I was simply…lost, and Tokyo Ghoul had no interest in filling me in. 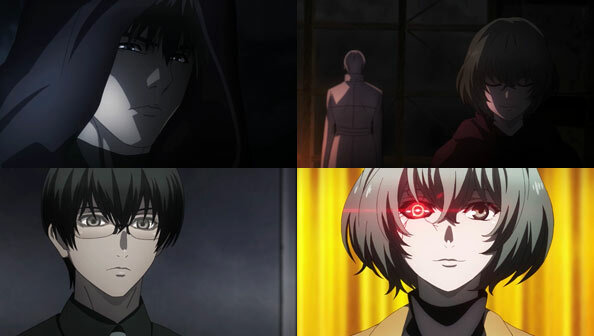 But for all I didn’t quite follow, three major story points were pretty obvious: Eto AKA Takatsuki Sen publically reveals that she’s a ghoul and surrenders to Kaneki Ken, “Sasaki Haise” seems to be gone or at least repressed and replaced by Ken, and the Doves have launched a final assault on Aogiri Tree’s HQ in Tokyo Bay, intending to eliminate them once and for all. We get a bit of Eto’s backstory as a homeless aspiring author who is “discovered” by Shiono, who eventually becomes her editor. Her latest (and stated final) novel, while ostensibly fiction, indirectly points to the real-life Washuu clan as Ghoul sympathizers. 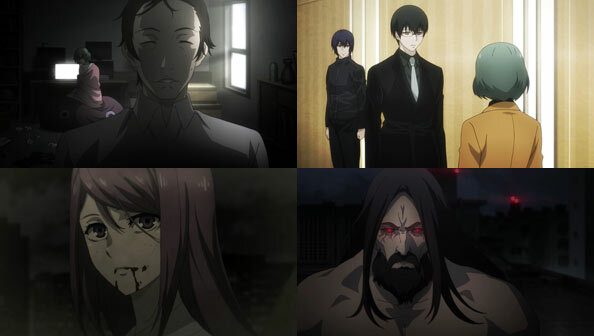 They, like Eto, her father Yoshimura, Kamishiro Rize (haven’t heard that name in a while) and her very badass father Orca are/were all members of an organization called “V.” However, in the present, Orca is slain by Arima Kishou, while Rize’s whereabouts are unknown. Furuta Nimura, a Washuu clan member, serves Eto her editor Shiono, whom he turned into pate, which is…not cool? 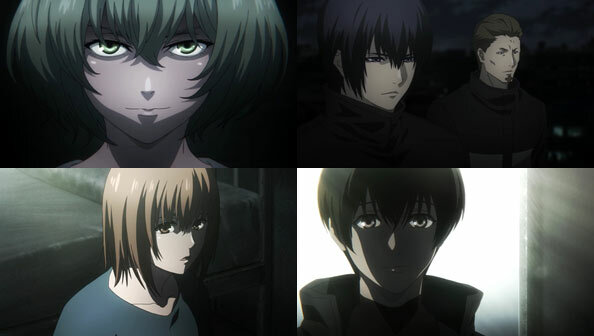 Eto simply quietly stews, as outside Ayato and others prepare another assault on Cochlea. Ken, meanwhile, is poised to release Fueguchi Hinami (who pointedly calls him nii-san). Eto is willing to help Ken with “what he wants to do” (whatever that is) in exchange for him killing the One-Eyed Owl, meaning…herself? Ah well, I can only blame myself for not being sufficiently well-versed in the source material—even if this was a weird episode for manga readers as well!